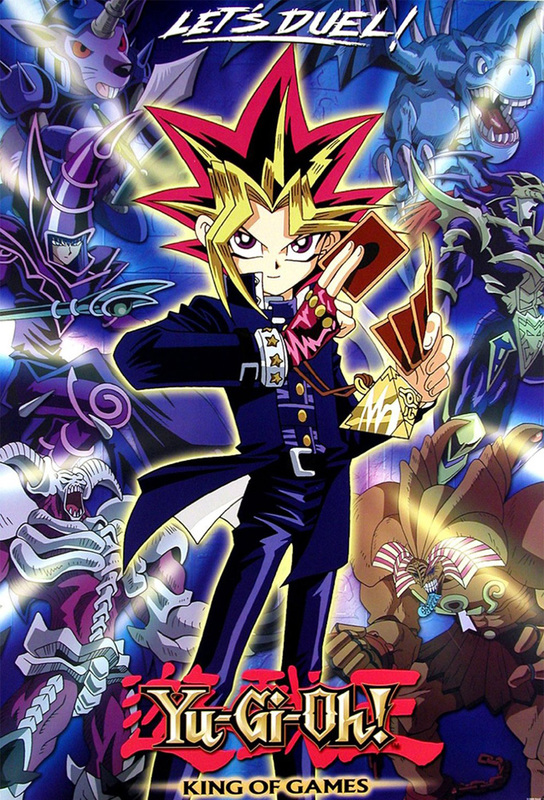 A boy named Yugi Mutou solves the Millennium Puzzle which turns in into the King of Games. A criminal escapes from jail and takes Anzu as a prisoner. Yugi shows his other self by using the Millennium Puzzle as he challenges the criminal to a Shadow Game in order to get Anzu back. Seto Kaiba is a new student in Yugis class and he is also a Duel Monsters (a card game) expert. After he steals the Blue-Eyes White Dragon from Yugis grandfather, Yugi challenges him to a duel where the cards are real. The game remains a tie and Yugi gets his grandpas card back. Shadi, the man from Egypt, challenges Yugi to a Shadow Game, with Anzus life as the prize. Yugi is kidnapped by Kaiba, and forced to duel the first of his four Game Masters, Count Ridley Sheldon. Can Dark Yugi defeat his doll monsters? The gang is concerned and confused when they see Jonouchi with a gang wielding yo-yos as weapons. Has he turned his back on his friends? Anzu clashes with the beautiful but sadistically strict Ms. Chrono, and organizes a petition to change the school rules. But Chronos underhanded counterattack ruins the petition--until Dark Yugi steps in. Yugis friend Warashibe is obsessed with Capsule Monsters, and Miho. When she spurns his advances, Warashibe decides to eliminate her friends--his competition for her affection. Fraudulent psychic Kokurano has his eyes on Anzu. Though Anzu doesent believe his predictions at first, her desire to see her mysterious savior (Dark Yugi) leads her right into Kokuranos grasp. When she realizes that Yugi is her mysterious crush, Anzu invites him on a date to an amusement park, intending to put herself in danger to see Dark Yugi. But she finds herself in real danger when a mad bomber challenges Dark Yugi to a twisted game of balloons and explosions. A new girl named Risa Kageyama wants to become Yugis girlfriend (much to Anzus anger). But Risa is actually intent on obtaining Yugis rare Violet Hectate card. Jonouchi has a crush on Miyuki, the nurse taking care of his sister Shizuka. But when a corrupt doctor fires her, Jonouchi cant expose him, or Shizuka will be kicked out of the hospital. Yugi befriends bullied youth Imori, and the two discover the forbidden game Dragon Block. The evil game overcomes Imori and he challenges Dark Yugi to a game with his soul itself on the line. Kaibas butler Daimon, an old man kept alive through machinery, duels Dark Yugi as the final Game Master. In the process, he reveals how Kaiba used to be, and implores Yugi to restore his kindness. Kaiba kidnaps Yugis grandpa and dares him to come to Death-T, an amusement park full of death trap games. But Yugi is hesitant to put his friends in danger. The gang heads through Death-T, making their way through a laser tag game with actual lasers, and a game of wits with a giant killer robot. With Honda seemingly dead, an enraged Dark Yugi battles Mokuba, Kaibas little brother, in Capsule Monster Chess. With his grandpa and friends at stake, Yugi duels Kaiba, and his three Blue-Eyes White Dragons, while Jonouchi and Miho battle Ryuchi and Aileen. With his friends support, Yugi pulls off the unbeatable combo--Exodia. Yami Yugi aids the others, reduced to figurines, against Dark Bakura and his RPGs boss, Dark Master Zorc. Even when seemingly defeated, Zorc rises again and threatens to overwhelm the gang. It is up to Bakura to defeat his evil counterpart.